Map Magic Infinite Terrain component is a helper plugin to add support for the Infinite Terrain feature of Map Magic. It will create and configure a new Vegetation System for each new terrain generated with Map Magic. A clone of the Source Vegetation System GameObject is placed as a Child object of the new created terrain. It will disable and enable with the terrain as it becomes active. See the setting up guide more info. Component showing error, Map Magic not installed in project. Select the source Vegetation System configures with the Vegetation Package you want to use with the run-time created terrains. It will be cloned and added to each new terrain. 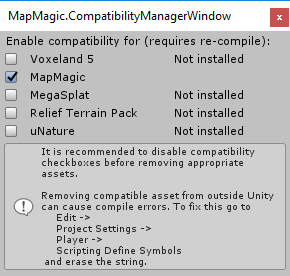 The plugin is looking for the MAPMAGIC Scripting Define Symbol in Unity in order to test for MapMagic in the scene and compile the integration. On the MapMagic compability manager make sure MapMagic is checked in order to get the scripting define.